Giveaway: To Win A Copy of the Book from the publisher, leave a comment below along with an email address. I will use Random.org to choose the winner Friday, May 18 at 9pm EST. The winner will have 48 hours to contact me with their mailing address. I will send the certificate from the publisher, to the winner for their free copy. Through a series of letters between devils created by Platt, senior devil Slashreap trains his young protégé, Scardagger, to win an individual soul away from Heaven and into their clutches. As the devils plot their way to triumph, they reveal the spiritual dangers and risks we face in today’s society. Their frighteningly accurate perspective on issues such as contemporary technology and sexual mores is interwoven with timeless matters such as the power of prayer, the purpose of suffering, and the promises held out by Heaven . . . and Hell. Destined to become a modern classic, As One Devil to Another is a brilliantly written, deeply unsettling perspective on twenty-first-century society . . . a glimpse of ourselves through the eyes of those who have embraced their underworldly existence. I have always been a fan of “The Screwtape Letters by C.S. Lewis. After reading this book I can say that if C.S. Lewis was still alive I would believe that this book was a sequel to his book. We meet Slashreap and Scardaggar. Slashreap is a demon who is mentoring his nephew Scardaggar in the fine points of corrupting people. This is a book that points out the subtle ways Satan makes every day things we do appear to be benign. It’s scary to read a book like this and realize as you are reading, ‘Hey that was me’. The letters from Slashreap to his nephew Scardaggar focus on everything from gluttony and over-consuming, to sexual depravity. You know those things we don’t need that we buy, “just because”, and those movies that have just a little bit of sexual content to them. Slashreap wants to make sure his nephew does everything he can to bring the “client” to the gates of hell. They speak of Christ as the adversary. I am sure that is how Satan sees him. I was taken aback by how easily our society has slipped up. We isolate ourselves with gadgets. We separate ourselves from our friends and children, wasting valuable time we could give to God with “things”. 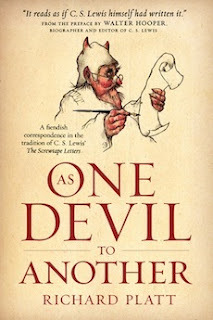 This is not only a modern retelling of “The Screwtape Letters”, but so much more. This should be read by every Christian. So many of these things didn’t seem important to me until I had finished the book. I had to look at the book and realize there were so many areas I actually became the “client”. This was something that I then needed to spend time praying about. I received this book free from the publisher. I was not required to write a positive review. The opinions I have expressed are my own. I am disclosing this in accordance with the Federal Trade Commission's 16 CFR, Part 255 : "Guides Concerning the Use of Endorsements and Testimonials in Advertising." You know I have never read a Christian fiction book, and this one sounds intriguing! I looked and looked, but couldn't find a way to contact you with my address.